Customer Jobs - What are customers trying to get done at work and in their lives in their own words? Customer Pains - What are bad outcomes, risks and obstacles related to customer jobs? Customer Gains - What are the concrete outcomes and benefits they are seeking? Answer the 3 main questions of your customer profile segment. Place most important answers in order of importance. Export the image of your results. Right click and save. Functional Jobs - complete a task, solve a problem, write a report. Social Jobs - When your customers want to look good or gain power or status. Personal/Emotional Jobs - When your customers seek a specific emotional such as feeling good and secure. Supporting Jobs - Buyer of Value, Co-creator of Value, Transferrer of Value. 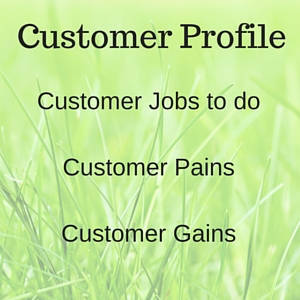 What are your customer segment jobs to complete within the 4 categories. Write your answers in the box below. Functional - Solution does not work or has negative side effects. Social - I look bad doing this. Emotional - I feel bad every time I do this. Ancillary - It is annoying to do this. Boring. Ugly. What are your customer segment pains? Write your answers in the box below. Required Gains - These are gains without which a solution would not work. Expected Gains - There are relatively basic gains that we expect from a solution, even if it could work without them. Desired Gains - These are gains that go beyond what we expect from a solution but would love to have if we could. Unexpected Gains - These are gains that go beyond customer expectations and desire. What are your customer segment gains? Write your answers in the box below. | Right click and save the customer profile image. Image will appear below once button is clicked.